Your child will be in the driver’s seat with any of our 2 piece NextStep toys. They are a perfect fit for your child’s “next” toy. Ages 18 months – 4 years. Each has a hitch & rolling wheels, just fill up with cargo & go. 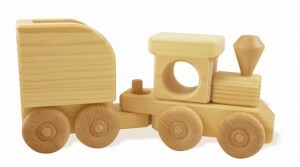 Produced with 100% sustainable Northern White Pine, a child safe finish and rounded edges.